It’s not often that I see something truly new in the real estate business, but I recently discovered a new solution to an old problem – which is getting real answers about flood zones and your insurance. As someone who does a lot of business in areas which suffered dramatic flooding during Hurricane Irene, I know how hard both the flooding and the subsequent insurance hikes were on homeowners. It broke my heart to see Lake Hiawatha residents trying to salvage precious mementos from their waterlogged homes, or Denville shop owners dragging their livelihoods to the curb. It broke my heart again to see how frightened everyone was about adding another insurance expense to their budgets. The one trend I’ve noticed a lot is homes which are right around the edges of high risk flood zones, but which have never had flooding inside their homes. Or in other cases there are homes which are grouped into the high risk category, but which have only rarely had flooding compared to their neighbors. In both of these cases, we have homes which deserve a second look before they pay top dollar on their flood insurance. There are so many tiers of flood risk and every step above where you belong is a costly one. First there is the insurance cost, but also, when they go to sell their homes these homeowners have the added stigma of being within that high risk classification. Up until recently, the only way I knew of determining a home’s flood status was to contact the town and ask about their flood maps. These maps gave me enough information to know the basics, but not much more. For instance, I couldn’t necessarily tell if the flood zone only reached a home’s backyard, but not the house. Given enough acreage between a marsh-y yard and a dry house, that’s a big distinction that’s worthy of consideration by your insurance company. Did you know that your home is only considered high risk if the flood zone touches your actual home – not just your land? Additionally, if you’re on higher ground than your neighbors, the FEMA Base Flood Elevation may be below your foundation – which would leave your home outside of the high risk zone yet again. So where do you go for these concrete answers? The innovation I learned about recently is through a company that overlays flood data on aerial photographs of properties. 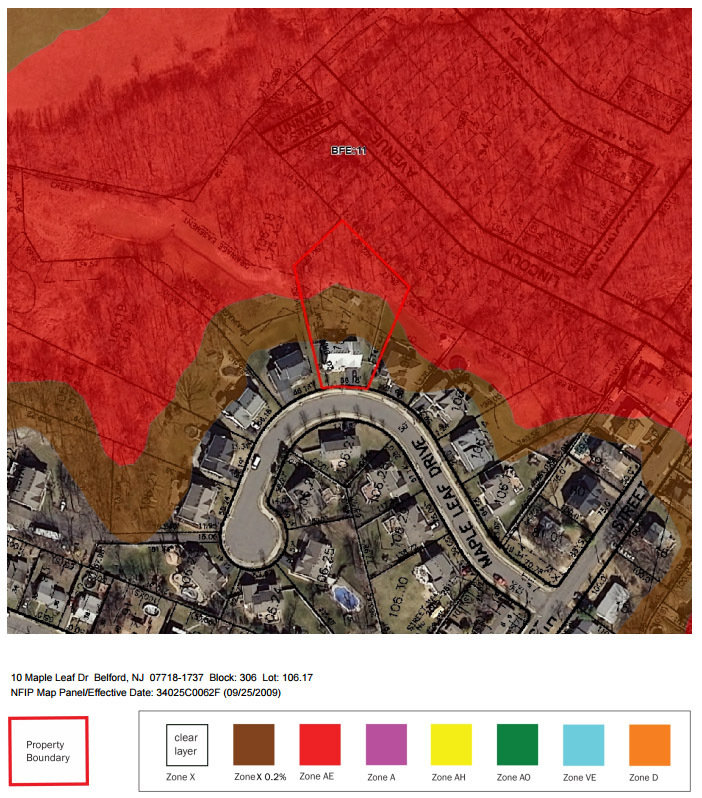 It’s possible to see exactly what portion of a property is within a flood zone in relation to the house and where the property is within the larger flood zone. They also take elevation into account and, if your property qualifies for a lesser flood zone designation, they can help you file a Letter of Map Amendment (or LOMA) in order to start the process of removing your property from the high risk flood zone. These reports are prepared by Certified Floodplain Managers with the expertise to give you the rock solid information you need to be certain you’re not paying more than your share of flood insurance. Many areas (including lower Lake Hiawatha) are currently due for a re-evaluation after the most recent flooding. There are some very old maps still in circulation and the crazy weather of the last few years has created a new world of problems for homeowners. If you want to get the best information about your property (or perhaps one you’re considering purchasing) please Call or Email me today and I’ll put you in touch with the experts!